The top two seeds took care of business in their first outings of the CIAA Tournament. 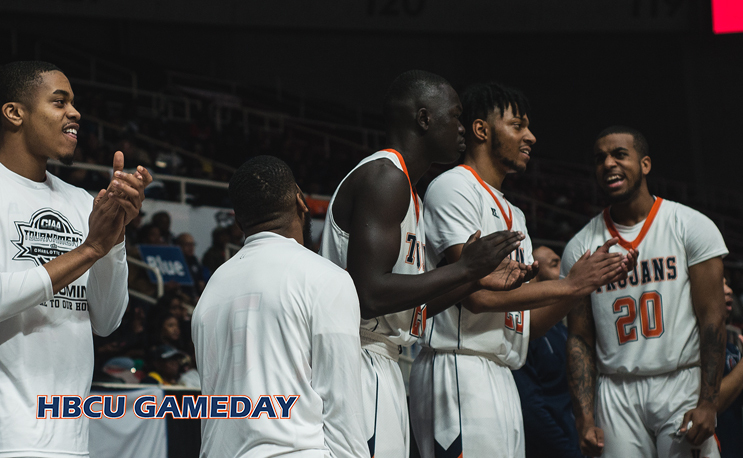 The top two seeds in the CIAA Tournament, Virginia State and Johnson C. Smith, stepped on to the floor a day earlier than usual. JCSU and VSU were both playing in Bojangles Coliseum in quarterfinal action on Wednesday night thanks to the conference’s bracket tweak. The top seeds in the CIAA Tournament normally rest until Thursday, but a break with tradition has been made in 2018. The result for both programs was a rusty start but both came away with wins and will now receive a day off for their trouble. Virginia State has been the top team in the CIAA all season, while St. Aug has been up-and-down. Despite their differences, the two treated tournament fans to an exciting finish. VSU led 19-13 at halftime, and the second half started out slow as well as the battle down low between Quincy January and Richard Grandberry was rough and tumble. St. Aug never let the game get out of reach, but VSU never seemed out of control and in the end came up with a 49-45 win. The Trojans await the Shaw-Virginia Union winner on Friday in the Spectrum Center. Johnson C. Smith came into Wednesday night looking to make a statement in its CIAA Tourney opener against Fayetteville State. Early on it was FSU making the statement as an 11-2 run at the end of the first half gave it a 32-28 halftime lead. The tightness continued in the second half as every time JCSU seemed ready to make a run, FSU would respond. The difference in the game turned out to be Roddric “RAWSE” who turned into Bernard King out there in the second half, breaking the Broncos off with the flick-a-da-wrist. He finished with 26 points and JCSU punched its ticket to the CIAA Final Four with a 68-58 win. Now, the Golden Bulls will wait to see who pops in their brackets next.